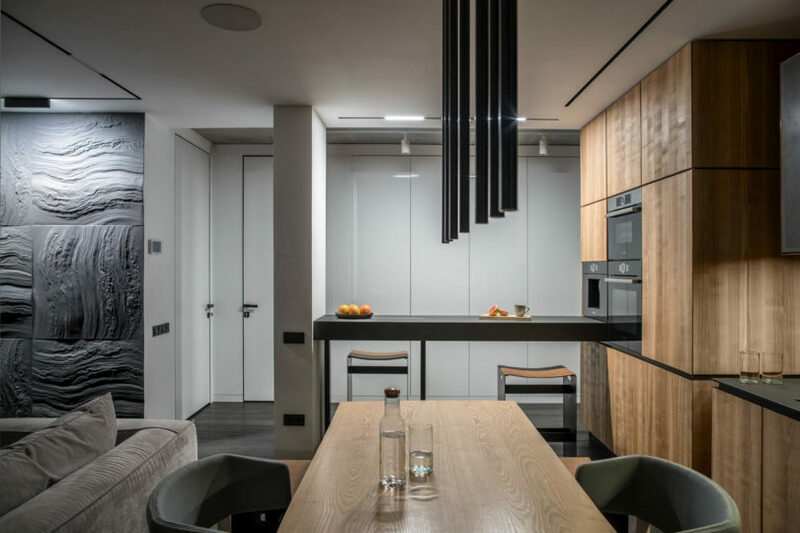 Minimal Mine is a renovation project headed by Maxim Doschinsky and Pavel Voitov of Ukrainian interior design firm ZOOI. The designers merged two apartments ? a one-bedroom and a three-bedroom ? to create a comfortable, yet modern home for a couple with children, who longed for a minimalist space that was packed with function. The kitchen, dining room, and living room were combined to form a larger, open space but with an oversized sofa creating some delineation. A cozy palette of neutrals fills the public spaces with hints of color speckled throughout. The designers’ sketches were translated into these decorative wall panels that mimic rough stone. A bright blue armchair that was custom made for this project pops in front of the charcoal gray panels. The master bedroom is essentially four spaces in one ? a bedroom, bathroom, closet, and office. A glass partition is used to provide separation between the bed and the workspace with a sliding curtain to offer additional privacy. The children’s rooms are where the project really comes alive with sunny yellow accents, rock climbing walls, and chalkboards.